Every time I've fired up Steam this week, I've been greeted by ads for a game called The Talos Principle. 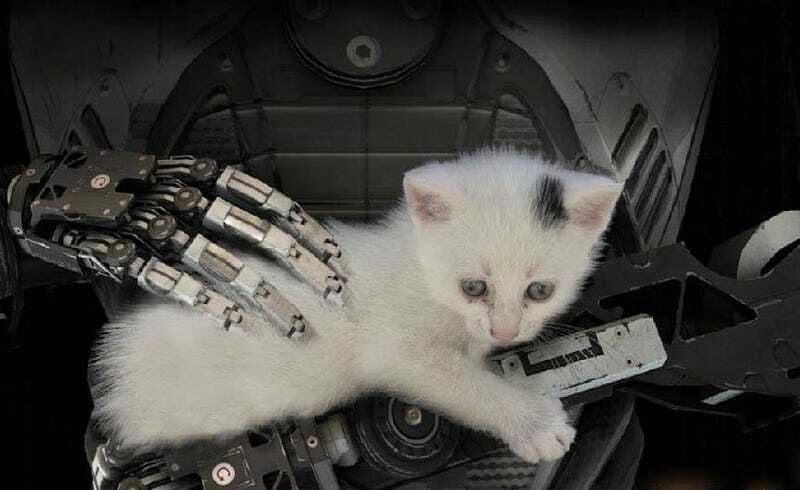 I'd never heard of it, but it had a picture of a robot holding a cat, so I installed it. I'm pretty glad I did. TTP is a first-person puzzle game with a heaping of philosophy tied into its narrative. There are all kinds of questions posed by the setting (hinted at in the trailer below), which you're free to sit back and ponder, but what I liked about the way TPP is structured is that you're also free to completely ignore it all and focus on the puzzles, since all the story comes from a narrator who speaks over your gameplay. I haven't finished the game yet, but what I have played so far is great. There's a gentle learning curve to the game's challenges, the kooky settings (you begin in an ancient Roman ruin that's...full of robots) keep it fresh and the visuals are surprisingly easy on the eye. There are also some nice little touches, like the fact that you move insanely fast - even faster when sprinting - which sounds silly at first, but goes a long way to removing the chore of having to traverse levels to solve puzzles. It's currently $36 on Steam.